Hi everyone. I am still doing fine. 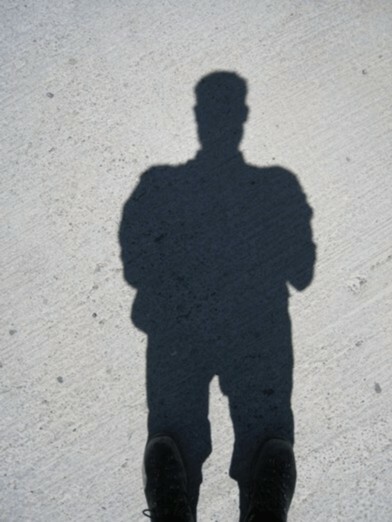 I have been spending a lot of time with my friend here, Shadow. Those of you who have read your D.J. Duncan (ed. David James Duncan) will recognize him as my "Garden Angel." He and I spend a lot of time together these days. In fact, we do almost everything together. Seems like whatever I feel like doing at any given moment, fishing, walking, building a fire, or even just sitting down and thinking, that's what he wants to do right then too! This is OK with me though. He keeps me company down here, and we actually have some pretty good conversations when we feel like talking. I know; I know; all of you back in the northern hemisphere are probably thinking that I am doing all of the talking and that Shadow is just a shadow and so he can't really even listen, much less hold up his end of the conversation. I can understand how you might think this; you all know that I am certainly possessed of enough native intellect to carry the conversation of three people all by myself, much less two, and loquacious enough to try it. But I assure you that this is not the case. Shadow is real! And he gets kind of grumpy when people think he isn't.